Michael Thomas went from practice player in San Fran to hero in Miami in less than a week. It’s amazing the things that can turn the fortunes of a team during the season: a toe out of bounds, a phantom penalty, a freak snow storm. Or in the case of Michael Thomas and the Miami Dolphins, a decision to roll over in bed and finally look at his phone. The defensive back made two big plays Sunday on passes thrown by Tom Brady in the waning moments of Miami’s victory at Sun Life Stadium â plays he wouldn’t have been able to make had he waited, oh, another half-hour or so to check his phone last Monday morning. 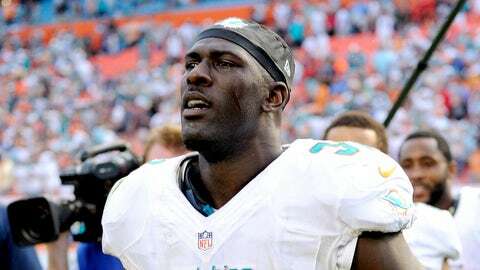 On the phone were missed calls and texts from his agent, Christina Phillips, who warned Thomas the Dolphins would move on if he didn’t get back to her pronto. Thomas was a member of the San Francisco 49ers practice squad at the time, so the Dolphins needed his consent to sign him to their active roster. It was 10:20 a.m. PT, but it was already afternoon in South Florida and the Dolphins had to make their move. Thomas got back to them in time. Six days later, he knocked a ball out of Danny Amendola’s hands on first down and then intercepted Brady’s pass for Austin Collie in the end zone on fourth down. Opportunity was calling. Thomas finally answered. The Dolphins are happy he did, and they’re happy to somehow still be in the AFC’s playoff race. "I’m glad my sister was there. We hurried up and threw stuff in the bag," a giggling Thomas told FOX Sports on Sunday evening via that same cell phone, which, coincidentally, he misplaced for a few hours after the game. "I made the difficult call to (49ers coach Jim) Harbaugh and (GM) Trent Baalke, talked to (defensive coordinator) Vic Fangio and (secondary coach) Ed Donatell, but it was something I had to do. I had to take a chance on myself to prove I can play instead of just staying on the practice squad." Thomas, an undrafted free agent, had been on the Niners’ practice squad since the start of last season. After San Francisco’s run to the Super Bowl, he received interest from a few teams but decided to stick with the 49ers. Though he was nearly promoted a few weeks ago, he remained on the practice squad until Miami called. Cornerback Jamar Taylor was inactive because of injury Sunday. Then, starter Brent Grimes left with a groin injury. So while it’s not the ideal situation to have a guy playing his first-ever NFL game after joining the team only a few days earlier, the Dolphins didn’t have much of a choice. Credit assistant defensive backs coach Blue Adams for putting in extra time with Thomas to get him adjusted to the playbook. "Cover-4 is still Cover-4," Thomas told himself, though he knew getting the on-field calls and checks from his teammates might be tricky. "Cover-3 is still Cover-3. Man is man." Thomas’ teammates had told him before the game to relax and that "it only takes one play to make a a name for yourself." Amendola had the ball in his hands on his way into the end zone. But Thomas had heard his college position coach Derek Mason in his head, telling him to "play though the receiver’s pocket and hands," even when he can’t make a play on the ball. Thomas’ left hand poked the ball out just as Amendola was crossing the goal line and trying to complete the catch. Fourth down. Seven seconds left. Thomas and safety Chris Clemons talked before the play about not trying to do too much. All they had to do was make a tackle inbounds and the game was over. Just don’t give up anything over their heads in the end zone. Thomas saw Julian Edelman run the under route away from his spot as the left nickel corner, so he peeled off to undercut a "bang post" route by Austin Collie on the outside. Interception. Ball game. The Dolphins (8-6) are currently the sixth seed in the AFC. And Thomas capped a crazy week in perfect fashion, with teammates who probably didn’t know his name congratulating and thanking him. "Definitely. You try to get to know as many guys as you can, but when you’re only there for four days, it’s hard," a laughing Thomas said. "I think we’ll get to know each other a little more now that I should be around for another week." Those who thought the three touchdowns Minnesota Vikings running back Matt Asiata scored on Sunday made for a good story simply because he had only three career carries coming into the game didn’t get the full picture. Asiata is a former junior-college transfer who suffered a broken leg and a torn ACL at Utah, entered the NFL in 2011 when the players were locked out for months, was briefly in the UFL (though he never appeared in a game), was cut by the Vikings, sat out a whole season, re-signed with Minnesota and served as a special-teams player before getting his first start against the Philadelphia Eagles this week following injuries to Adrian Peterson and Toby Gerhart. But the worst thing to happen to Asiata in recent years came in late October when his father, Pita, died in a bus accident near the Utah-Nevada border. Sunday’s game was bittersweet for Asiata. "I wish my dad was here to witness it," he told reporters afterward. But Asiata’s performance was a testament to his perseverance. He became the first player to rush for three or more touchdowns in his first NFL start since former Vikings quarterback Daunte Culpepper in 2000. Asiata’s stat line wasn’t the prettiest — he ran for only 51 yards on 30 carries – but the three scores and the reaction of the sideline after the last one showed his teammates know what Sunday meant to him. "It’s really a blessing to be out here and be part of this team," he told FOX Sports. To show how far he’s come, Asiata couldn’t even remember the name of the team he briefly joined in the UFL. "The Omaha . . . somethings," he said. Told it was the Nighthawks, Asiata said, "The Nighthawks, yeah. Like I said, it was really a blessing to be out there today." I asked Alex Boone if he agrees with the notion that, in the modern, parity-driven NFL, the real season doesn’t start until the turkey and trimmings are on the table. "Absolutely, and I don’t want to be misquoted here . . ." the San Francisco 49ers’ guard said after the team’s 33-14 victory over the Tampa Bay Buccaneers. OK, so we’ll quote him in full. ". . . because — don’t get me wrong, the whole season’s important — but you hit it right on the nose — as soon as Thanksgiving comes, that’s when the real football starts. As long as you get a ticket to the big show and you’re on a momentum wave and riding that wave, nobody can stop you. "Hey, look at the Ravens last year. They got in on a wild card, they were playing some great football and they won the (Super Bowl). As long as you get a ticket and you play well, nothing else really matters." Six of the past eight Super Bowl champs (including last year’s Ravens) did not have a first-round bye, which indicates momentum might have eclipsed rest as the biggest factor come playoff time these days. The 49ers, who are on the verge of nailing down a playoff spot, will not have a bye. With the Seattle Seahawks about to clinch the NFC West, the Niners will be a wild card. But given recent history, that means they’re as much of a contender as their division rivals. In fact, following the tougher-than-the-score-indicated win over Tampa, the Niners have the longest winning streak in the NFL, four games. With their final two games against the Atlanta Falcons and Arizona Cardinals, it’s certainly conceivable they could enter the postseason on a six-game tear, which would make them the bye-less team nobody wants to face in January. So when Harbaugh called the matchup with the Bucs a "must-win game," he was talking about the need to keep the momentum going, not the need to win the game for reasons of standing and seeding. "Every game is a must-win right now. If you want to prove you should be in the big show, you have to win in December. And that’s what the good teams do," Boone said. "We’re going to take this momentum, keep going forward. And if you don’t like it, hey, we’ll truck you over, too." 1.) One more from Boone, and this one had to do with the 52-yard touchdown pass from Colin Kaepernick to Vernon Davis. It started so well, with Boone hearing someone yell, "Oh boy!" Boone saw Davis running with Buccaneers safety Mark Barron and knew his teammate was the one who had the better shot to make a play on the ball. That’s exactly what happened, and it was a gorgeous touchdown, though what followed next wasn’t so pretty. Davis channeled his inner Gus Frerotte by jumping into the wall behind the end zone and coming away a bit staggered. He was OK and didn’t leave the game, but it wasn’t the wisest decision and nearly put him into the boneheaded celebration Hall of Fame. "Dude, it was awful," Boone said. "I thought he was just staring at the ground. I’m like, ‘Vernon, what are you doing?’ Then, he and Kap looked like they were having a private conversation. I’m saying, ‘What the hell, man? I want to be a part of this, you know?’" Not if it means running into a wall, though. "Yeah, pretty much," he said. "You know what, I’m just gonna block this cat right here. You guys go do your thing." 2.) New York Giants tight end Brandon Myers will surely be meeting with coach Tom Coughlin on Monday, despite the fact he’s already realized his mistake of taking his gripes about an exchange with an unnamed teammate to Twitter. "Getting cussed out for encouraging ppl am telling them they did a good job is mind blowing," Myers wrote. "If ppl on this team wanna take shots at me an say I have no passion they are mistaken. I give everything I have each an every week." Shortly thereafter, Myers tweeted, "My emotions got the best of me. I just want to win. All focus and energy will be on that." First, good for Myers for not playing the phony I-was-hacked card. No one would’ve bought that one. That said, the code of the locker room states that kind of stuff is to stay behind closed doors, even if Myers didn’t name the player. It’s not like anyone had any idea he’d had an exchange with a teammate. Sniffing around on this one, it seems there’s been some tension between the offense and defense, seeing as how the Giants’ offense has struggled greatly — they’re the only NFL team to get shut out this season, and it’s happened twice — and has turned the ball over an NFL-high 38 times. So perhaps Myers got some flak from a defensive player. Either way, don’t be surprised if there are some big personnel and coaching changes coming on the offensive side of the ball for the Giants this offseason. 3.) Elsewhere in Twitter clarifications, Dallas Cowboys wide receiver Dez Bryant tweeted this after he left the field before the end of the devastating loss to the Green Bay Packers: "I walked back to the locker room because I was emotional…it had nothing to do with my teammates we had it… We fought and didn’t finish." The Bryant defenders will say it was a sign of him being competitive and it’s the same thing the Houston Texans’ Andre Johnson did earlier this season. I’ll answer the latter by saying that doesn’t make it OK for either player to leave the field before the clock shows all zeroes. That’s never, ever acceptable for a healthy player. And as for Bryant’s competitiveness, that’s an extremely admirable trait. But just like Ndamukong Suh has to control the raging personality that also makes him an effective player, Bryant needs to remember he shouldn’t act out like he did in Detroit earlier this year or abandon his teammates before the game is over. 4.) Speaking of the Cowboys, Jerry Jones’ refusal to declare Jason Garrett’s job remains safe was, in so many words, a no comment. And it was many, many words. "Don’t in any way interpret in any way my refusal to get involved in that kind of discussion here tonight with anything different about me and Jason’s future," Jones told reporters. "That’d be a bad mistake to think anything is different." Jones said last month Garrett’s job was safe. Few believed him because he’s backtracked before and because it’s hard to fathom he’d bring back Garrett if the Cowboys miss the playoffs for a fourth straight season. Few are listening now when Jones is warning folks about looking too much into his non-comments. Face it: Garrett is gone if the Cowboys don’t make the postseason. And the way their defense is playing, it’s hard to imagine they’ll be playing in January. 5.) The Houston Texans did not rally around Wade Phillips. They did not play well for a man who has been a head coach before and is often popular with players. They didn’t respond to the firing of Gary Kubiak by beating the Indianapolis Colts. No, they were beaten by the Colts. Badly. And you know what? That’s a good thing for the franchise because the Kansas City Chiefs rallied behind Romeo Crennel late in the 2011 season after Todd Haley was fired to win two of their last three games, including a victory over the then-undefeated Green Bay Packers. It fooled ownership into thinking their next full-time head coach was already on the sideline and so the team peeled the interim tag off Crennel. It was a big, big mistake. Luckily for the Chiefs, they bounced back by hiring Andy Reid, but 2012 was a wasted season. The Texans will waste no time and won’t be fooled by any late-season push under Phillips. They’ll bring in an outside hire, which is probably best in this case. * Aaron Rodgers: Welcome back to action in Week 16. Well, that’s the hope, anyway. The tests and scans this week will tell the full story. But if he’s indeed back, Green Bay has as good a shot as anybody, no? * Jamaal Charles: He etched his name into the record books (first NFL player with four or more receiving TDs and a rushing TD in the same game) and the hearts of fantasy owners forever. * Richard Sherman: Attention: quarterbacks, if he’s underneath your wide receiver running a vertical route up the sideline, DO NOT throw the ball. I repeat: DO NOT throw the ball. Sigh, Eli Manning, you should’ve listened the last 10 times I said that. Rarely, if ever, does that end well. * Greg Schiano: Remember that investigation on whether he violated the confidentiality rules of the substance-abuse program and leaked information on Josh Freeman being in the program? Yeah, well, that’s ongoing. Freeman’s agents recently interviewed with NFL investigators. Don’t expect much to come from it. Oh, and it continues to look like Schiano’s job is safe. * Kirk Cousins: He did just what he had to do to put himself out there as a potential starter for another team. * Kyle Shanahan: I said on FOX Sports Radio on Saturday morning look for him and his father to split up this offseason, no matter where Mike Shanahan lands. (The NFL Network reported the same thing on Sunday.) Mike wanted Kyle to make his name while coaching on other staffs, not his own. Kyle believes it’s time for that to happen once again. * Robert Quinn: Ka-ching. Easy money for the St. Louis Rams’ defensive end this offseason, as he of the 15 sacks should see some good coin in a contract extension. * Indianapolis Colts: See what happens when you play from ahead? The Colts’ first-quarter touchdown on Sunday was their first since Oct. 20. Incredible. * Jay Cutler: The Josh McCown defenders were sharpening their tongues in the first half. Cutler barely escaped their wrath. But good for the Bears’ locker room and coaching staff for making it clear from the moment last Monday’s game was over that Cutler is their guy. * Cincinnati Bengals: Just when you think they’re going to put it all together, they show you why they just can’t be considered a top contender.